Jerome Bettis is a former NFL halfback who played for the Los Angeles / St. Louis Rams from 1993 to 1995 and the Pittsburgh Steelers from 1996 to 2005. He was a six-time Pro Bowl selection for 1993, 1994, 1996, 1997, 2001 and 2004, a two-time First-team All-Pro for 1993 and 1996, a Second-team All-Pro for 1997 plus he is a Super Bowl Champion for Super Bowl XL in 2006. 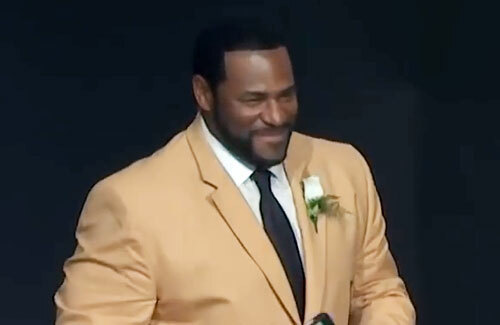 Jerome Bettis was awarded the NFL Offensive Rookie of the Year for 1993, the NFL Comeback Player of the Year for 1996, the Walter Payton NFL Man of the Year for 2001 and he was inducted into the Pro Football Hall of Fame in 2015. Bettis is considered to be one of the best big backs of his era and was an integral part of the Pittsburgh Steelers winning Super Bowl XL. He is a commentator for the NFL Network and a former NBC studio analyst for Football Night in America.